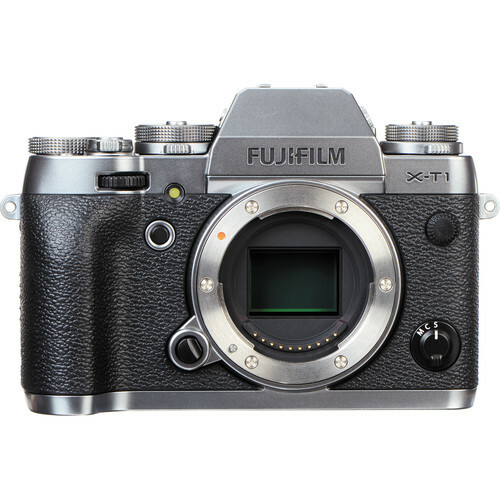 Featuring a highly unique graphite silver finish, and contextualized by its sensor design and high-resolution electronic viewfinder, the Fujifilm X-T1 Mirrorless Digital Camera is an advanced camera poised for both action and multimedia shooters. Incorporating a 16.3MP APS-C-sized X-Trans CMOS II sensor and an EXR Processor II, this camera can record up to 8 fps, as well as full HD movies, with an expandable sensitivity range from ISO 100-51200. Fujifilm's proprietary X-Trans sensor uses a unique randomized pixel array in order to avoid the use of a resolution-reducing optical low-pass filter, therefore providing images with the utmost sharpness and clarity. Furthermore, the X-T1 is designed within a weather-resistant magnesium alloy body that houses a 0.77x-magnification Real Time Viewfinder, tilting LCD, and a manual, dial-based control scheme. Complementing the tried and true Fujifilm technologies, the X-T1 features an enhanced handling system that enables its use in a wide variety of shooting situations. This special edition of the X-T1 also stands to differentiate itself through its triple layer coating and ever-changing color scheme. The imaging system is benefitted by the Intelligent Hybrid AF system, which uses both contrast- and phase-detection methods to acquire focus quickly and accurately. Enhanced manual focusing capabilities are also a result of these technologies; Digital Split Image and Focus Highlight Peaking are two methods for quickly and precisely determining focus using intelligent focusing aids for improved control and optimized efficiency. For image monitoring, review, and menu navigation, both a 2,360k-dot OLED electronic viewfinder and a 3.0" 1,040k-dot tilting LCD screen are available. The body design extends this versatility through the implementation of manual, physical control dials on the top plate of the camera as well as customizable buttons and a Q Menu button for expedited access to some of the most useful settings. This control scheme further enables an intuitive built-in Wi-Fi system for direct sharing of imagery to an Android or iOS mobile device for instant sharing online. The special edition Graphite Silver version of the X-T1 features a uniquely durable and aesthetic triple layer coating finish that serves to both protect it and give it tremendous visual appeal. Succeeding an initial antioxidant treatment to the magnesium alloy body, a matte black primer coat is first applied. This helps to develop a shadow-like appearance that also accentuates the highlights developed by subsequent coats. The second step in the finishing process involves rotating the body at high speeds while thin strips of paint particles are layered using computer-controlled Thin-Film Multilayer Coating Technology, which produces the smooth graphite silver-colored look. Finally, a clear coat is applied for added durability and shininess based on the ambient lighting conditions. Beyond the unique coating and appearance of this camera, the Graphite Silver edition also contextualizes itself through the incorporation of an electronic shutter feature, which avails a top shutter speed of 1/32,000 of a second, and by the inclusion of the Natural Live View feature, which electronically replicates the viewing experience of working with an optical viewfinder. A large 16.3MP APS-C CMOS image sensor is integrated into the X-T1 to provide high image quality and detail. Using Fujifilm's unique X-Trans bespoke pixel array, the sensor is designed with a randomized pixel pattern to eliminate the need of an optical low-pass filter for reducing moiré and aliasing. By removing this filter from the design, higher image sharpness is possible. Lens Modulation Optimizer (LMO) factors are also taken into account using the EXR Processor II, which helps to automatically compensate for aberrations and diffraction blur in order to produce images with the utmost inherent sharpness. The X-Trans sensor also works to provide highly effective noise reduction and a clean signal-to-noise ratio. This enables smoother-looking imagery that becomes especially apparent when photographing in low-light situations with an expanded sensitivity range of ISO 100-51200. Additionally, a top continuous shooting rate of 8 fps is possible, for up to 47 consecutive frames, to benefit working with moving subject matter. Aside from benefitting low-light performance, the EXR Processor II also provides quick performance throughout the entire camera system. The camera start-up time is about 0.5 seconds, shutter lag is about 0.05 seconds, and the shooting interval time is about 0.5 seconds. An electronic shutter can also be utilized to attain shutter speeds as quick as 1/32,000 sec. to benefit working with even the speediest of subjects. A fast autofocus performance speed of 0.08 seconds is also enabled using the advanced Intelligent Hybrid AF system using both contrast- and phase-detection focusing methods. Intelligent Hybrid AF is a quick, responsive autofocus system that employs both contrast- and phase-detection methods to acquire focus quickly in a wide variety of lighting conditions and shooting situations. Clear focus can quickly be attained to aid in catching fast-paced movement more easily. Three focus modes are available (AF-S, AF-C, and M) for greater control over how the X-T1 achieves sharp focus. When working with autofocus, the AF area is divided into a 49-point matrix in order to gain clear focus of any type of subject matter. Additionally, a built-in AF assist lamp is available for aiding the focus system when photographing in low-light situations. When working with manual focus, two additional features can be employed for enhanced critical focusing in a more controllable manner. By using the phase-detection pixels located on the imaging sensor, Digital Split Image technology is able to assist in acquiring precise focus through the implementation of four striped focusing aids; akin to a rangefinder focusing method, once these stripes have been lined up, sharp focus can be ensured. Also contributing to manual focus accuracy, Focus Peak Highlight has been integrated and enables a more objective system of focusing by way of highlighting sharp edges and lines of contrast, using one of three colors, once they are in focus. An advanced electronic viewfinder has been incorporated into the X-T1's design to support clear eye-level monitoring along with a host of unique viewing features to better support a more efficient overall workflow. The Real Time Viewfinder is comprised of a 2,360k-dot OLED display and features an exceptionally high magnification of 0.77x, along with a 31° angle of view. This perspective is further complemented by the 0.005 sec. lag time, which smoothly and seamlessly renders scenes and moving subjects. To further enhance the viewing capabilities in difficult lighting conditions, Natural Live View can be utilized to display an image quality similar to as if working with an optical viewfinder, and the Preview Picture function can also be disabled to further extend the natural viewing experience..
FULL: This mode takes advantage of the high magnification ratio of the viewfinder and produces an image that fills the majority of the viewfinder in an unobstructed manner. Shooting information is presented at the top and bottom edges and does not interfere with the image frame itself. NORMAL: This mode enables you to focus on the composition at hand while still having an in-depth understanding of camera settings and shooting conditions. VERTICAL: When the camera is held in a vertical orientation, the information display automatically rotates so it is facing upright for easier reading of camera settings. When working in this mode, images can also be reviewed in the vertical orientation. DUAL: Serving to benefit those working with manual focus, this mode presents a split screen view of the scene where you see both a regular view as well as the Focus Assist View (Focus Highlight Peaking and Digital Split Image) at the same time, allowing you to concentrate on the image composition as well as critical focus accuracy. In addition to the four viewing modes, the shooting information displayed within the viewfinder can also be customized to suit one's needs. 19 different settings can be toggled on or off depending on preference. Featuring a body design reminiscent of SLR film cameras, the X-T1 exhibits a meshing of both analog exposure controls along with intelligent automated technologies. The clean and functional body design incorporates physical shutter speed, ISO, drive mode, AF mode, and +/- 3 EV exposure compensation double-deck precision-milled aluminum alloy dials that pair well with the manual aperture rings found on many of the XF lenses for intuitive exposure setting selection. Depending on individual needs, six customizable buttons, dual command dials, and an easily-accessible Q Menu provide an efficient solution for modifying some of the most frequently used camera settings, such as ISO, white balance, and file settings. For more extensive menu navigation, as well as live view monitoring and image review, a 3.0" 1,040k-dot LCD monitor is available and features a tilting design to better support working from high and low angles. Furthermore, the magnesium alloy body also features approximately 80 points of weather sealing to protect itself from dust and moisture, as well as temperatures as low as 14°F, for confident use in trying conditions. Taking advantage of Fujifilm's vast history in traditional film-based photography, the X-T1 integrates several Film Simulation modes to mimic the look and feel of some Fujifilm's classic film types. A refined Classic Chrome mode is designed to deliver muted tones and a deep color reproduction, similar to that of a dated slide film. Pulling from their more contemporary line of transparency films, Provia offers natural-looking tones for everyday shooting, Velvia produces a more dramatic and rich tonality with deeper color saturation, and Astia gives less contrast for a softer depiction of skin tones. Mimicking their negative films, Pro Neg. Std. gives smooth image tones that are suitable for accurate color renditions, while Pro Neg. Hi produces a more dramatic feel with the ability to draw color out of a variety of lighting conditions. In addition to the colorful benefits of these Film Simulation modes, there are also monochrome modes that simulate the look of traditional yellow, green, and red black and white contrast filters. A sepia mode is also available for producing an inherently nostalgic look. An in-camera RAW converter lets you record your images in 14-bit RAW and process them prior to computer-based editing procedures. This process enables you to modify the exposure, white balance, and other controls directly through the menu interface. Additionally, for more thorough processing of files, RAW File Converter software is included for RAW image processing on your computer. When the electronic shutter feature is being used, the mechanical shutter will automatically be disabled in order to realize a completely silent shooting experience. Compatible with UHS-II memory cards for fast transfer speeds during shooting. Motion panorama mode allows you to record expansive views up to 360° wide in a seamless, sweeping manner. The included EF-X8 shoe-mount flash has a guide number of 26.2' at ISO 100 and provides additional illumination to imagery for photographing in dark conditions. A sync terminal is also available for use of additional optional external flashes. Four different auto bracketing modes are available: Dynamic Range, Film Simulation, AE, and ISO Sensitivity.